For the last 20 days or so, I have been writing a haiku daily as part of a hashtag project called #HaikuForHealing that my friend, Mary Lee Hahn and others thought up as a way to keep moving forward with writing and staying positive in a world that seemed to shift in November towards the negative (OK, and January might bring us right into the negative again). I looked around on Twitter, found a hashtag that was previously unused — #haikuforhealing — and got started with my Haiku-a-Day in December a week early. 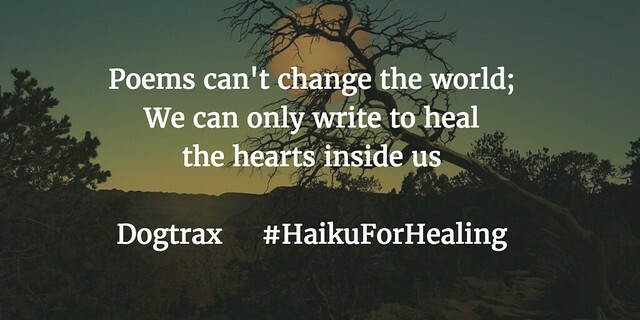 It’s helping my heart already — both the writing, and the small community that’s growing around #haikuforhealing. They started right on December 1 but I didn’t. Tomorrow, I am gathering up all of my haikus together into a single project. Poetry is the world already transformed. Glad you are finding the deep well of grace that poetry is. And that you have drunk from it. Thanks for all of your contributions during this past year. I look forward to 2017 and the new ideas you will shine a light on.